We're Martha Stewart American Made Finalists Again! Today we learned that we're finalists for a Martha Stewart American Made Award for the second year in a row! Check out the page and leave a comment. Thanks to everyone for your support! After leaving Hong Kong, the first stop on my first trip to Southeast Asia, I headed to Indonesia, a complicated and beautiful nation of over 19,000 islands. The first stop was Jakarta, the capital, and a notoriously stressful, traffic-clogged megapolis, and my goal was to try and find its design scene, if it had one, and hopefully some architectural and design beauty inside what I'd discover to be an extraordinary and terribly frustrating city. One of the large roundabouts in Jakarta's center. The Intiland Tower, designed by Paul Rudolph in 1986, as seen from my taxi while sitting in grid-lock traffic. Traffic in Jakarta at a standstill next to a construction site for the new train system that will go above and below ground and will be the first mass-transit available in Jakarta, besides some busses and a regional train. The entrance to Indoestri, a space offering classes and support to Jakarta's growing maker scene. Plates, cake stands, and other wares by General Object, a Jakarta-based accessories studio. The town square in Old Batavia, the city built by the Dutch during their colonial rule, that is now a decaying neighborhood inside sprawling Jakarta. Families like to come to hang out and take portraits on weekends. 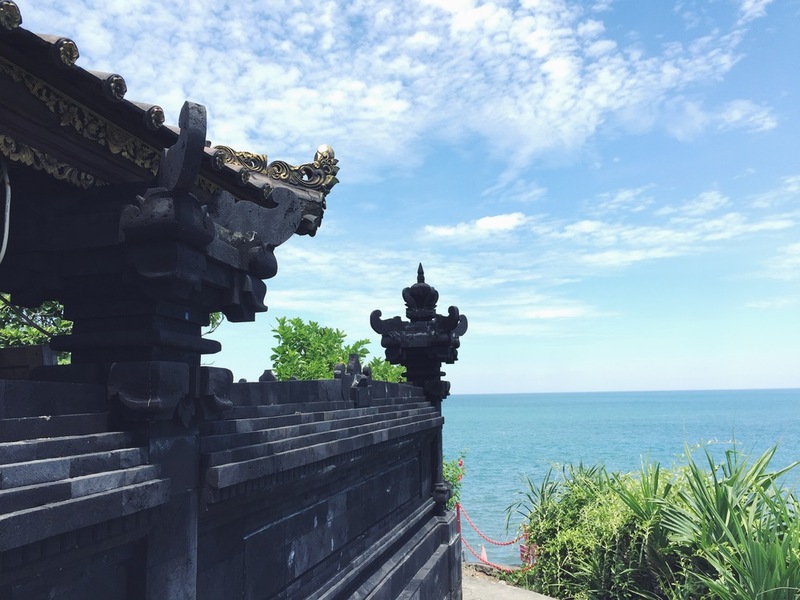 After a week exploring Jakarta, which is on Indonesia's largest and most populated island, Java, we flew to Bali, only a few hour flight, but worlds away in its architectural appearance. The people of Indonesia practice many religions, but the Balinese practice their own form of Hinduism that is only found on Bali and in Balinese communities elsewhere in the country. Faced with extreme tourism, the Balinese hold strong to their religious and cultural beliefs and lead beautiful and fascinating lives. Our first stop was the lively town of Seminyak, filled with shops and great beaches, but also with tourists. We quickly rented moto-bikes so we could get around and out of town. This proved to be the best decision of the trip and allowed us to find places we never would have seen in a car or on foot. Our second stop was Ubud, a mountain village known as the cultural center of Bali. There too we took our moto-bikes and found that outside the touristic town the real beauty of Bali was waiting to greet us. Chic cafés abound in Seminyak. 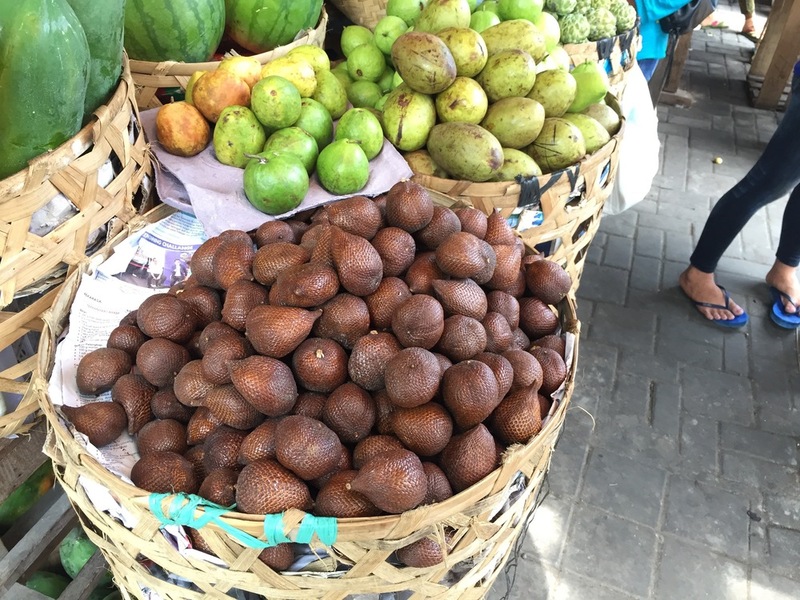 The open-air market next door to Delu Villa. One of the many temples we visited. Tanah Lot is a temple located on rocks in the ocean and is one of the most spectacular temples in Bali. Head 20 minutes outside of any town on your moto-bike and you'll find farm fields like these. This one was planted with watermelons. This is a rice paddy. 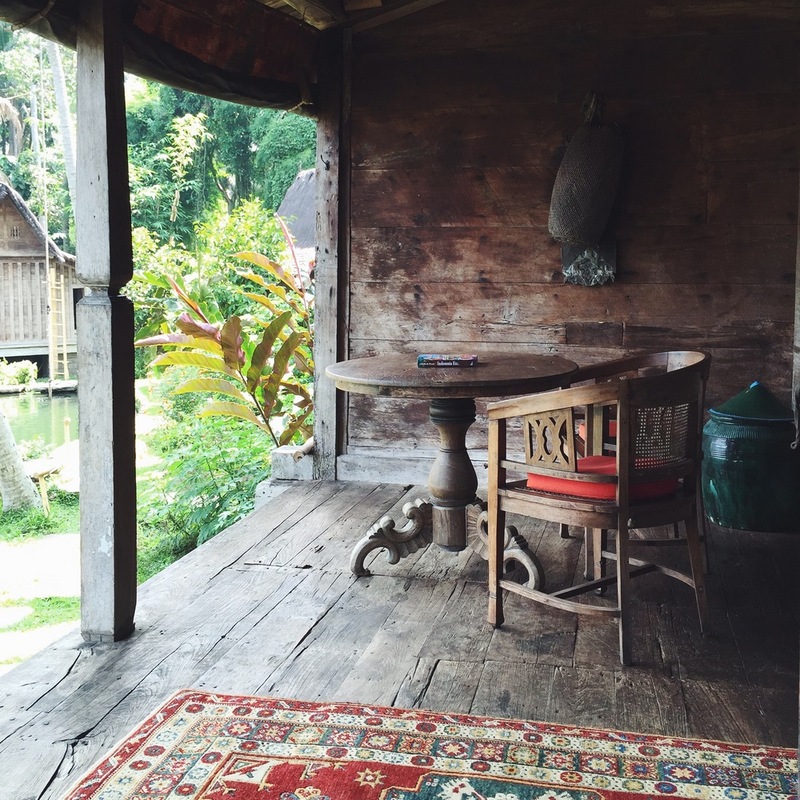 While in Ubud we stayed at Bambu Hinda, an eco-resort made of bamboo structures and old Javanese bridal huts. The entire resort has views of rice paddies and serves some of the best food in Bali. The terrace on the bridal hut, where we stayed. We also visited The Green Village, a community of houses made entirely of bamboo. One of the many traditional Balinese dance performances offered in Ubud. All are recommended. This is PT Bamboo, the factory that makes bamboo houses and furniture that ship all over the world. We visited The Green School, a school entirely off the grid, that creates the green leaders of the future. On the final day of our trip we came upon this shop in Ubud offering traditional antiques and wares from the island of Timor in the South of the country. We had to buy an additional suitcase to bring our purchases home! This temple has a natural spring inside it. Around the outside are spouts that let the water, which is considered holy and very cleansing, flow into separate pools. In these pools people line up submerged themselves under each spouts literally be glanced by the water and by the Gods. We are excited to announce that Blackbody CO-OP has been extended and our collection, along with beautiful works by other up-and-coming designers will be on view at the Blackbody Showroom at 25 Greene Street in Soho for six months. Please stop by, have a look, and the let us know what you think! Brooklyn furniture design studio, Coil + Drift, seeks a studio intern to begin June, 2015. As part of NY Design Week Coil + Drift will be a part of the inaugural Blackbody Co-op, an exhibition of contemporary furniture and objects by a selection of on-the-rise designers amongst the latest designs by French lighting studio, Blackbody. Taking place in the immense two-story Blackbody showroom at 25 Greene Street in Soho, Blackbody Co-op will take place May 15 - 19 and will partner with the Soho Design District. Coil + Drift will show items for their latest collection at Blackbody Co-op including the Rex Sideboard, a cherry-wood sideboard with deep-grain character and a mirrored wine-and-spirit compartment; the Dusk Coffee Table, a coffee table with a geometric, solid-brass base and white-marble top; and the Soren Chair, a minimal, ash-wood and leather dining/side chair with a bold, arc-shaped back rest, available in black and brown leather. Based in France and founded in 2007, Blackbody develops and produces innovative OLED lighting solutions, based on a new lighting philosophy, which encourages creativity and emotion. Thanks to its technological savoir-faire and the flexibility of its production capacity, Blackbody is the perfect partner for the conception and production of innovative OLED lighting, either on a tailor-made or large-scale level. Blackbody CO-OP will feature work by Asher Israelow, Aspace, Coil + Drift, Further Designs, Hart Made, Matthew Bradshaw Studio, and Surname Goods among others. Come by and see some incredible interior design, purchase furniture, and support Housing Works! At the beginning of April I had the rare opportunity to hop on a plane and travel to Southeast Asia. Being that I love an adventure, I leapt at the chance. On the itinerary was Hong Kong, then Jakarta, Indonesia, and finally Seminyak and Ubud, on the island of Bali. This being my first trip to Southeast Asia, I knew I needed to savor every moment so I made it my goal to learn as much as I could about the design scenes of each vastly different city. This is the first of three travelogues that I will write about the one of the most extraordinary journeys of my life, one for each section of my trip beginning with Hong Kong. Speak to anyone about visiting Hong Kong and the first thing they will tell you is there is no way to see everything in one trip. This city of seven million people is extremely vibrant, full of culture and diversity, and a breeze to navigate thanks to Cantonese/English signage, incredible public transit, and (when all else fails) cheap taxis. When I travel I like to make a rough plan at the beginning of each day and then allow it to fall apart as I get lost and discover unexpected places. I knew that four days in Hong Kong would not be enough to do everything I wanted to so I allowed myself to let go of my expectations and to enjoy neighborhoods, shops, galleries, and cafés more than I might if I stuck to a strict schedule. The city that unfolded before my eyes when I stepped out the door of my hotel each day was vast and yet incredibly locally-minded. A major metropolis that is both easy for a Westerner to understand and worlds away. I stayed in the Central area on Hong Kong Island and set out my first morning to explore the Sheung Wan neighborhood, which I had been told housed many of the design showrooms in the city. I loved this quiet and hilly neighborhood, which reminded me of San Fransisco mixed with a little bit of London. As is mandated by law, all of Hong Kong's buildings must use bamboo scaffolding while under construction, including sky-scrapers, which is both magical and terrifyingly beautiful. I found many shops selling furniture, new and antique, much of it imported from Europe, but one that I absolutely loved was Amelie & Tulips, which sells new pieces in the mid-century modern aesthetic mainly from The Netherlands. Sheung Wan has many small alleyways and these are where I found my favorite spots. I noticed Common Ground, a quiet coffee shop and café, after spotting a beautiful antique chair outside the shop as I peaked up a hilly carless alleyway. The coffee was perfect and the owners welcoming and full of good conversation. 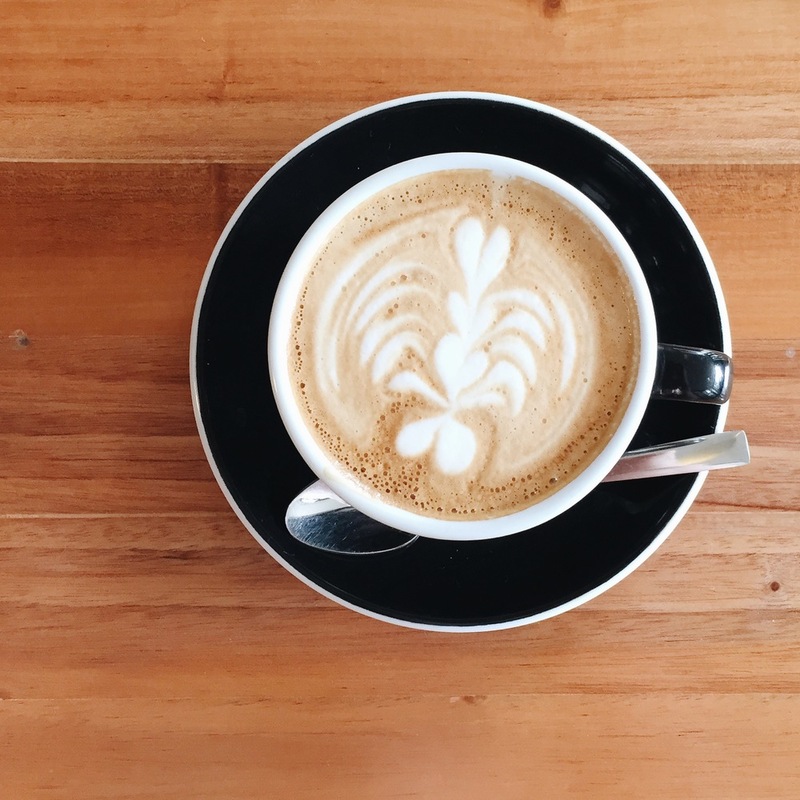 In a city with a vibrant coffee scene these guys stand out. After I got my coffee fix I headed to the Gagosian Gallery's Hong Kong outpost as well as Pearl Lam Gallery (conveniently housed in the same building). I wasn't blown away by the work they were showing but was glad to stop in. That night we went out in search of some of that delicious food Hong Kong is known for. We headed to Yardbird. I had walked by it during the day and later read that it was one the hot new spots in town that many said wasn't to be missed. As many new restaurants in any large city around the world, they don't take reservations, so we gave them our name and phone number and headed to find a bar in which to enjoy our two-hour wait. Thankfully we found Mitte Bar, a grungy-chic Italian bar close by. The drinks were perfect and in no time were back at Yardbird enjoying one of the best dinners I've had in months. The Chinese/American-influenced Japanese fare is wacky and extraordinary and the sake list is vast and delightful. Don't miss Yardbird. The next day I headed to the water to get some perspective and grabbed an old-and-efficient Star Ferry to Kowloon across the harbor. These ferries have been running forever and are a great way to discover Hong Kong's vast harbor. I didn't have time to explore much of Kowloon, but the view of Hong Kong Island from the water front was beautiful and well-worth the $2.50 HKD cost and 10 minute ride. Back on Hong Kong Island I headed for Kennedy town, high up in the hills where the University of Hong Kong is located. 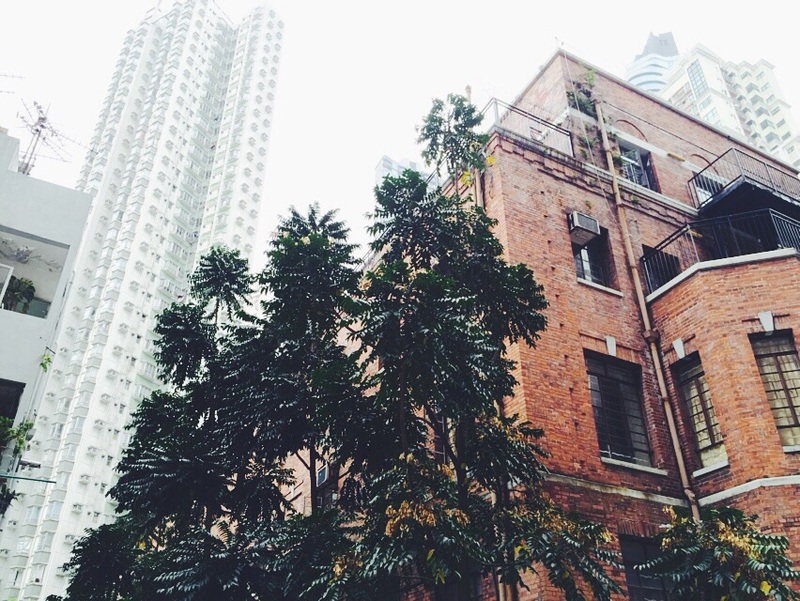 One of the many old buildings on the University of Hong Kong campus. Heeding a tip from a friend I met the day before I headed to Ethos, a new concept café, shop, and gallery space in Kennedy Town that is intelligently curated and filled with creative items for the home and workplace. I chatted with one of the owners about what it was like to open a multi-genre lifestyle shop in Hong Kong and he told me it was still very rare and risky but he felt it was the future of live retail, something I've heard from many people in cities from NYC to Paris and now to Hong Kong. After wandering the hills and getting myself thoroughly lost I happened upon Café Deadend. Situated next to it's equally-delicious sister bakery, this spot serves fresh fare and the salad I ordered on the chef's recommendation, was brightly flavored and delicious. I wanted to spend ours in the beautifully-designed space sipping my cappuccino. Our last day in Hong Kong we hopped on a boat and headed 30 minutes from Central to Lamma Island based on a recommendation from my friend Sonia Scarr of Scarr Co. Sonia had told me that Lamma Island is part of Hong Kong, but is feels like it is worlds away. This completely car-less island turned out to be a must-see for the views and natural landscape alone and exceeded our expectations in so many ways. After jumping off the ferry we took a four-hour hike through jungles, tiny villages, over white-sand beaches, and finally back to the 'town' where the ferry dropped us for a lunch of the morning's catches by the local fisherman. 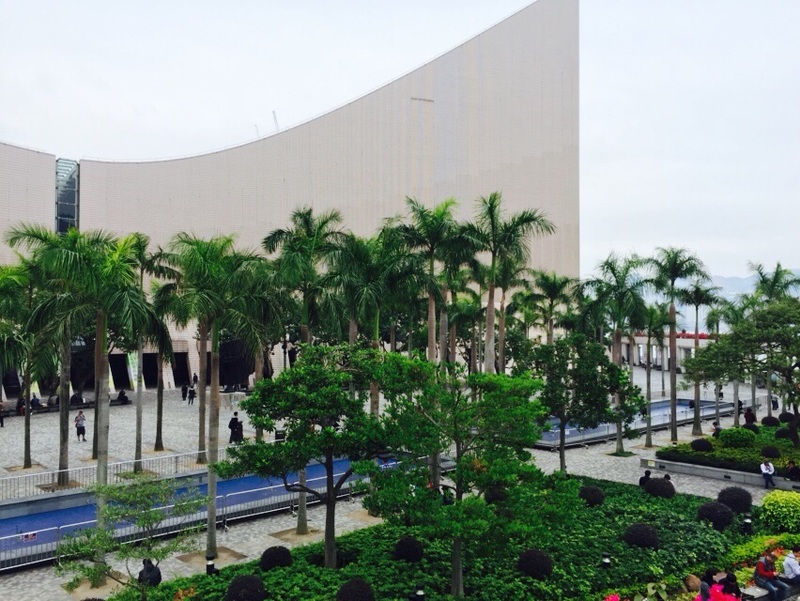 It was a stunning place I will never forget and it is something everyone should see to experience the extreme varieties and juxtapositions that make up Hong Kong. On our final morning we headed to the center of town to catch our plane. Now, that may sound odd, but one of the most innovative moves Hong Kong has made is the Airport Express station in Central Hong Kong. Located at the IFC, a massive downtown shopping center, the Airport Express is a train that takes you directly to the airport. Not only is it fast, (20 minutes door to door) but upon arrival to the station you check your bags and you don't see them until you've flown and landed at your destination. That means you can check your bags, do some shopping or grab lunch, and then take your train - luggage-free - to the airport and directly to your gate. Why every city doesn't have this system is beyond me. It was so easy and left me with memories of a Hong Kong as a city that is welcoming, complex, accessible, and full of life. I can't wait to go back and discover even more. Have you been to Hong Kong? Do you have must-sees that I missed. Please leave a comment and add to the discovery. Thanks! Hey, that's our Dusk Coffee Table in Domaine Home! Thanks Lonny Magazine for including our Soren Chair in your 'First Look - Market Finds' section about the Architectural Digest Home Design Show this weekend. Check it here. We just joined VSCO last week and we are delighted to have two photographs of our work featured on the VSCO Grid today. Ever wonder what marble looks like before it becomes a Dusk Coffee Table or your kitchen countertop? And that's a wrap! After a month long residency in the lower level of Jill Lindsey, a lifestyle boutique in Brooklyn's Fort Greene neighborhood, our Pop-Up Shop is closed and we are taking a moment to breath and reflect on this incredible experience. This past Sunday, NYC's local 24-hour news station, NEWS 12, stopped by Coil + Drift's Holiday Pop-Up Shop at Jill Lindsey. Giveaway: Win A Dome Lamp! Wedding / event planner and social media superstar Lauren Wells came to our studio over the weekend to pick up her Dusk Coffee Table and see our studio. Today, Brooklyn-based furniture and object design company Coil + Drift announced it will open a Holiday pop-up shop in the new lower level of JILL LINDSEY, a lifestyle boutique and café in Fort Greene, Brooklyn. Coil + Drift's Hover Shelving Unit is designed with flexibility in mind. Recently owner John Sorensen-Jolink moved to a new home in Brooklyn, NY and took his original Hover Shelving Unit with him. The new space was had a completely different shape and offered an opportunity to reconfigure the shelving unit to fit perfectly. John's Hover Shelving Unit in its original home. This configuration took advantage of the space above the doorway. 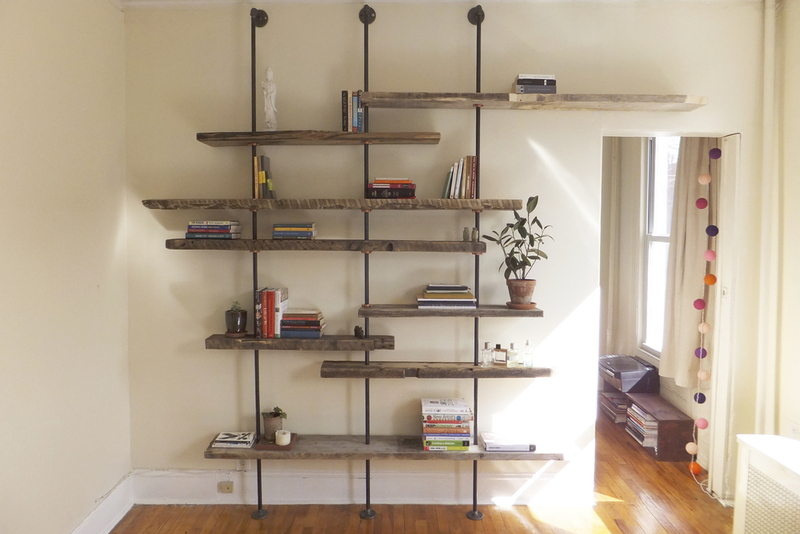 Made of assorted hand-selected reclaimed wood, iron piping and steel clamps, the completely customizable shelving unit is ideal for the city-dweller because it can be easily reconfigured and disassembled and moved. Books were displayed in alternating vertical and horizontal stacks. In the new apartment, the shelves are rearranged to frame the desk and cascade up the wall diagonally to hide an uneven wall. Of course, the flexibility of the Hover Shelving Unit is not just reserved for the folks who hop around a lot. The easy installation and movability (there is no need to screw the feet of the unit to your floor) means you can reconfigure the shelves and move the unit from room to room just for a change of pace. The reconfiguration of the unit and books reveal many titles that had gone unnoticed for years, like a modern French translation of the Bible (hey, why not?!) and many travel books from all over the world (time to travel!). Maybe it's time to invest in a space so that you can finally curate your personal collection and be proud of you treasures. We are nominees for a 2014 Martha Stewart American Made Award and we need your help! There ten awards given, one being an audience favorite award. That's where you come in! Click here to cast your six daily votes for Coil + Drift! You have 6 votes each day, so select "Vote Again" on your confirmation page to put all your efforts towards supporting Coil + Drift. Not only will you be supporting the work of American makers, you'll also automatically be entered to win a new prize each week worth over $300. Passion is contagious, and we're counting on you to keep the momentum going! Will you cast your vote today? A few weeks ago Apartment Therapy stopped by to take some photos of Coil + Drift owner, John Sorensen-Jolink's apartment. We love how the story turned out and are thrilled to see so many Coil + Drift pieces featured. Check it out here. Purchase the wine rack here and head over to Jill Lindsey to grab the Wine + Wine Rack gift.